UNIST Professor Yun Woo Jeong of Design and Human Engineering. Professor Jung's work will be on display at Davinci Codex Exhibition from December 23 to April 16, 2017. UNIST Professor Yun Woo Jeong of Design and Human Engineering has been invited to showcase his work at Davinci Codex Exhibition, held in Seoul 284 from December 23 to April 16, 2017. The exhibition aims to show new approach and interpretation of the works by a leading figure of the Italian Renaissance, Leonardo da Vinci. In this exhibition, entitled Da Vinci Codex, Professor Jung will present his recent work, Autonomous Mobile. 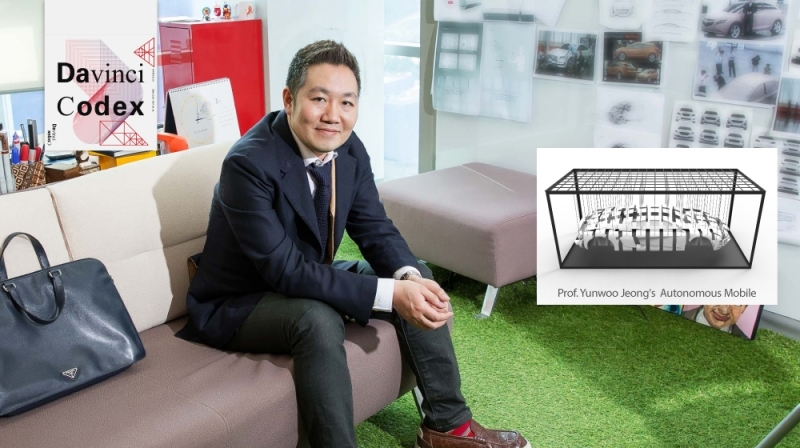 Professor Yun Woo Jeong is also the senior designer of Hyundai Motor company. His work is the result of dismantling and combining the concepts of Leonardo Da Vinci’s first automobile concept and the present automobile. The form is a mobile that disassembles the car shape and throws it into the air. The exhibition theme, Codex refers to a vast collection of about 300 artworks left by Leonardo da Vinci for the past 37 years. The deep consideration into nature, science, mathematics, technology, inventions, graffiti, and etc. that are provided in the notes of Da Vinch have had a profound impact on many human beings, including artists. Among the participating artists, Studio Drift will exhibit ‘Shylight’, a light that uses various kinds of flowers. Jang Sung, a designer and art director at the Industrial Design Department of University of Illinois-Chicago will present his recent task MOBI, concerned with the process of industrial design and characterized as being far from design through the process, deals with how design related instruments can contain architectural, aesthetic, and psychological stories. Professor Sang Bae Kim, a world-renowned robot engineer at MIT will present his recent work, ‘Cheetah Robot’ to show the dynamic movement based on the animal biomechanics. Meanwhile, a Korean actor Ah-in Yoo was actively promoted as an ambassador for the young child, and was given the voice guidance of Korean audio guide. There is also a special docent program for visitors to experience the exhibitions in various ways and to deepen their understanding of Leonardo da Vinci. English docent will be delivered by a broadcaster Tyler Rasch and the theme song for the exhibition is prepared by Bang-Eon Yang, a composer and a pianist. During the exhibition period, there will also be a children’s docent program set up to cater to children, along with a curator-led docent program. Moreover, unlike regular exhibitions, the show will prepare a theater, “Da Vinch Insight” presenting the identity of Da Vinci Codex, as well as an augmented reality game, “LEO-GO” for all ages to experience.